Yahoo has reached a deal to start running advertisements in Adobe's popular PDF document-reading format. The service will allow publishers to make money by including adverts linked to the content of a PDF document in a panel at the side of the page. It is Yahoo's latest way of expanding the places it can advertise online following deals with the auction site Ebay and the cable TV group Comcast. The advertisements will not appear if the PDF document is printed. 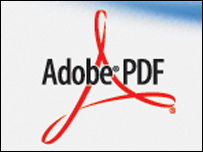 It is the first time that Adobe has allowed dynamic adverts into its PDF (Portable Document Format) files. Dynamic adverts can be changed for particular audiences or rotated to make sure that a particular user never sees the same advertisement twice. PDF files can be created by a range of software and can then be read by people who have a PDF reader, such as Adobe's Reader. The PDF format has proved popular with both companies and home users, and has been used to produce large reports and shorter newsletters, as well as preparing documents for printers.